Mahmoud Abbas met U.S. Secretary of State and UN Secretary General and informed them of agreement with Hamas. The new Palestinian Authority (PA) interim government will be presented on February 18 in Cairo, according to Azzam al-Ahmed, a member of the central committee of Fatah and the head of the terror group's delegation to reconciliation talks with Hamas. The interim government is to function until elections are held for the presidency and parliament, and its central function will be preparing the ground for the elections. 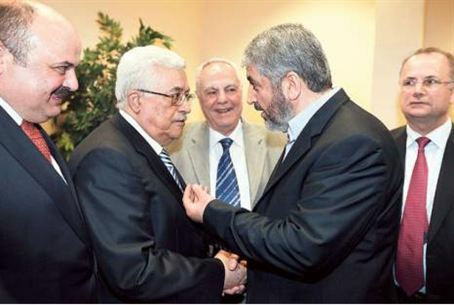 PA head and Fatah leader Mahmoud Abbas and the head of Hamas' political bureau, Khaled Mashaal, met in Qatar Monday and signed an agreement according to which Abbas will head the interim government, which will be made up of "independent technocrats." Abbas reportedly also spoke to U.S. Secretary of State Hillary Clinton and to U.N. Secretary General Ban Ki-Moon and informed them of the agreement that he signed with Hamas.